Nepal’s best kept secret, the Manaslu Circuit Trek is an adventurous journey through the remote western Himalaya region. This route is a challenge and offers unspoiled beauty as it winds its way through spectacular terrain and culturally fascinating areas. Cross the Larkya La, a demanding remote pass that sits 16,752 feet above sea level, where breathtaking views of Himlung, Himal, Cheo, Himal, Kang Guru and Annapurna II can be appreciated. 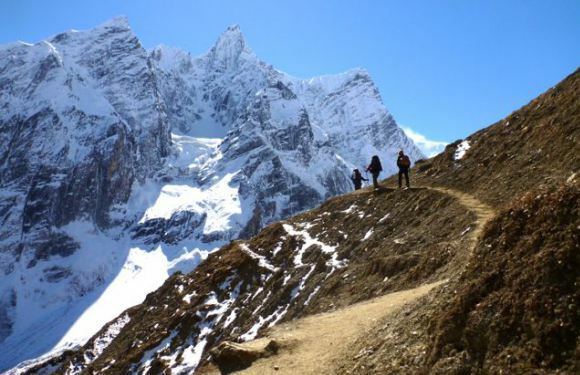 The scenery along this trail is comparable to the classic Annapurna Circuit trek, without the crowds due to its location within a conversation zone that is strictly managed. 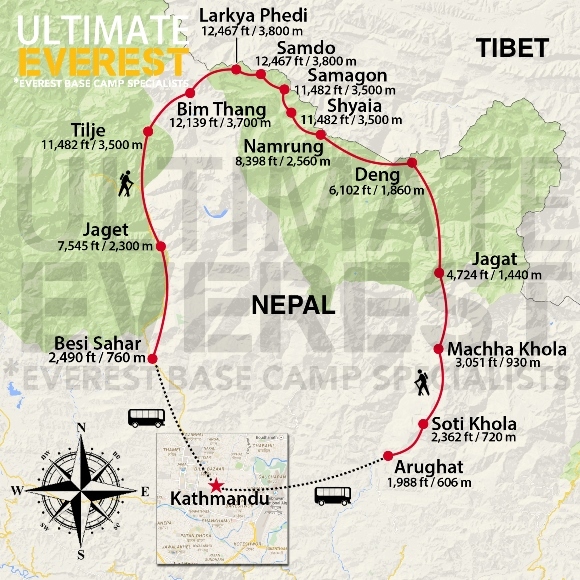 The trip begins and ends in energetic Kathmandu, Nepal where your adventure starts with a 6 hour drive to Arughat (approximately), the trailhead for the Manaslu Circuit Trek. Our hand-picked guides are trained and licensed by the Nepal Mountaineering Association to ensure you have a safe and enjoyable trek. And the itinerary for this hike is designed with a generous amount of time for acclimatizing safely, which is the key to any successful trek in the Everest region. In addition, Nepal is home to some of the friendliest people and the most diverse scenery on the planet. Witness the “Mountain of the Spirit,” the eighth highest peak in the world, which towers twenty six thousand seven hundred eighty one feet above sea level. 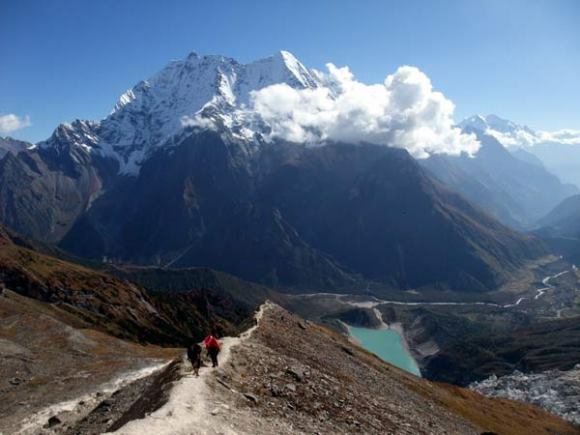 Join us for an unforgettable adventure on the Manaslu Circuit Trek. The Manaslu Circuit Trek offers lodge accommodations. Today we travel to Arughat, the starting point for our trek via the Pokhara Hwy, roughly a six hour drive. The path follows the Budhi Gandaki River, passing through rustic villages and rice fields. We ascend slowly to Kyoropani, and then descend to Soti Khola our village for the evening. After crossing a bridge the path climbs a steep ridge, and then descends to the banks of the Buri Gandaki River. In places the trail clings to the side of a rocky cliff, we pass the Gurung village of Labishe as we make our way to Machha Khola. From Machha Khola, we head to Jaget passing a natural hot sprint in Tatopani along the way. The trek today is steep and exposed in some places making it moderately difficult. We descend the stone steps to the river then begin the climb to hill of Saguleri and witness the magnificent views of Sringi Himal in the distance. We trek through a deep gorge with towering walls and numerous river crossings until we reach the village of Deng. After passing though the village of Lama, Mani Stones will become present. These are prayers etched onto rocks and are present in the Buddhist region. The trail crosses the river several times today and as we gain altitude and traverse into alpine territory the scenery becomes even more spectacular. We climb to the Tibetan village of Sho where Manaslu North and Main come into focus. The trail passes through the large village of Lho as we continue on to Shyaia. Today’s trek follows the river bank with beautiful views of Peak 29 as a backdrop. Observe Manaslu’s raw beauty as we detour from the main trail to visit Manaslu Base Camp. Then re-connect with the route and climb steadily to the Larkya La pass to Samdo. Snowcapped mountains tower above as we push toward Larkya Phedi. We pass ruins of a once thriving village that has diminished. We will stay in the Larkya Phedi lodge that is just at the foot of the pass. The ascent of Larkya La (16,752 ft) is a gradual winding climb, until we reach the northern face of the Larkya Glacier. From the top the views of Cho Danda and Larkya Peak are incredible. A long descend to the valley trail we pass the village of Tambuche, and finally arrive Bim Thang. Our hike begins with a gentle climb towards Karcha La pass. The descent begins after crossing the small pass until reaching Tilje. Today is the last day of the trek and quite pleasant. We will be trekking through farm lands and terraces, passing several villages along the way. After an easy morning hike we arrive in Besi Sahar and drive approximately 6 hours to Kathmandu.